Let’s compare parallelograms and triangles. Here are two copies of a parallelogram. Each copy has one side labeled as the base $b$ and a segment drawn for its corresponding height and labeled $h$. The base of the parallelogram on the left is 2.4 centimeters; its corresponding height is 1 centimeter. Find its area in square centimeters. The height of the parallelogram on the right is 2 centimeters. How long is the base of that parallelogram? Explain your reasoning. Two polygons are identical if they match up exactly when placed one on top of the other. Draw one segment to decompose each of the following polygons into two identical triangles, if possible. If you choose to, you can also draw the triangles. Pause here for a small-group discussion. Study the quadrilaterals that were, in fact, decomposable into two identical triangles. What do you notice about them? Write a couple of observations about what these quadrilaterals have in common. Draw some other types of quadrilaterals that are not already shown. Try to decompose them into two identical triangles. Can you do it? Come up with a general rule about what must be true if a quadrilateral can be decomposed into two identical triangles. This applet has eight pairs of triangles. Each group member should choose 1–2 pairs of triangles. Use them to help you answer the following questions. Discuss your responses to the first question with your group. Then, complete each of the following statements with all, some, or none. Sketch 1–2 examples to illustrate each completed statement. ________________ of these pairs of identical triangles can be composed into a rectangle. ________________ of these pairs of identical triangles can be composed into a parallelogram. A parallelogram can always be decomposed into two identical triangles by a segment that connects opposite vertices. 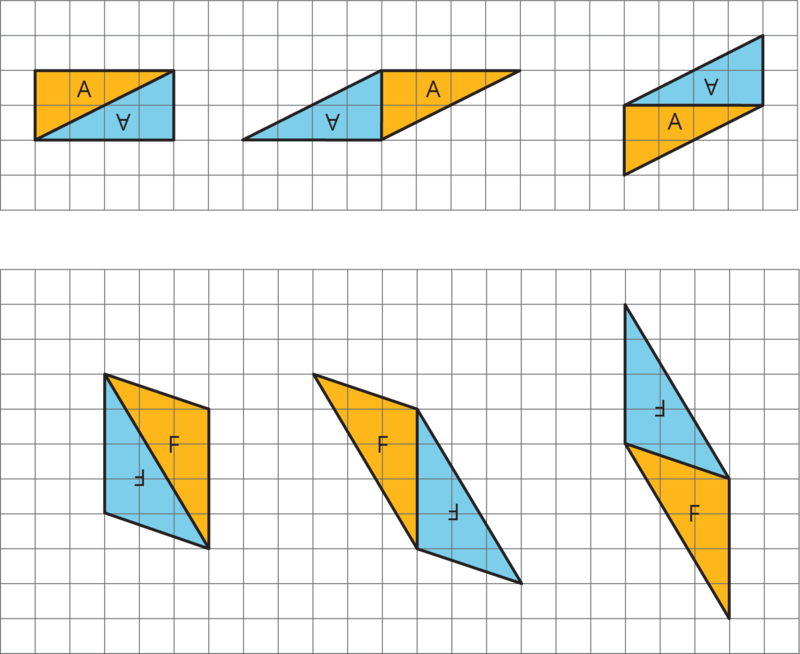 Going the other way around, two identical copies of a triangle can always be arranged to form a parallelogram, regardless of the type of triangle being used. To produce a parallelogram, we can join a triangle and its copy along any of the three sides, so the same pair of triangles can make different parallelograms. Here are examples of how two copies of both Triangle A and Triangle F can be composed into three different parallelograms. This special relationship between triangles and parallelograms can help us reason about the area of any triangle.